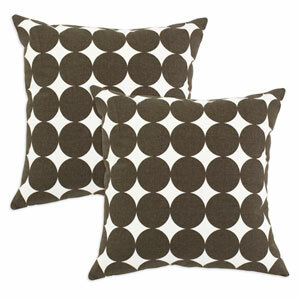 Give the gift of comfort this holiday season with this set of two Dotscape brown pillows by Bellacor. What more of an ideal way is there to let that special someone know you care, than to present them with a gift that is certain to provide lasting comfort and enjoyment for years to come. This high quality, designer pillow set is crafted from one hundred percent recycled polyester fill, with a cotton blend shell to maximize comfort and durability. The unique dotted design is sure to add character to any home decor. The fade resistant Dotscape pillow cases are machine washable and dryable for your convenience. Give your loved ones this stylish and comfortable pillow set this holiday season, and create a lasting impression!